Californian science-fiction writer, anthologist, reviewer and author of seven detective novels and numerous short stories William Anthony Parker White, known better under his penname Anthony Boucher (which rhymes with voucher), was one of the most important figures in the genre, perhaps only second to Fredric Dannay, whose critique and insightful comments on the works of his fellow composers in crime were especially significant – and which are still heavily consulted today by readers and historians alike. He also appears to have been an admirable and multiple talented human being, who, despite lifelong health problems culminating in an early death, enjoyed life to the fullest and only had something bad to say about Mickey Spillane (LOL!) – and what better way to squeeze as much enjoyment out of life as humanly possible than by plotting and writing detective stories? There's definitely a lot to enjoy about The Case of the Solid Key (1941), which features his redheaded shamus, Fergus O'Breen, who was created as a West Coast version of Ellery Queen, however, he's much closer to your typical gumshoe than the brilliant amateur reasoners of Ellery's ilk. The majority of the plot focuses on what goes on at Carruthers Little Theater, a small theatrical company dedicated solely to selling contracts of young and upcoming actors and writers to Hollywood agents, but the opening act takes place in a restaurant where Norman Harker, an aspiring playwright, saves one of their actresses, with whom he promptly falls in love, from an embarrassing situation by paying her bill. One thing leads to another and the next thing he knows he's neck-deep in the muck and none of it seems to stick. There's no discernible reason why Rupert Carruthers, the manager director of the place, should produce an awfully bad play, entitled The Soul Has Two Garments, by one Lewis Jordan, a shabby old man with a turbulent past, or why a detective from homicide is poking him about a 13-year-old murder case and why Fergus O'Breen is snooping around the place in the guise of a wishful actor. Of course, with a detective in the middle of it all it doesn't take very long for the inevitable corpse to rear its ugly and badly burned head – found inside a workshop with all doors and windows securely locked from the inside. It's a very readable story that offers the reader a picture of Hollywood of the 1940s, and the struggle of young talent to make a name for themselves in this world, as well as an interesting problem in which the clues are, perhaps, a bit thinly spread around, but they're enough for the observant reader the piece together most of the solution before Boucher produces a neat little twist on an old trick – resulting in an ending that you can both "solve" and still be surprised at. No mean feat! 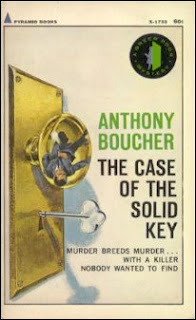 The solution to the locked room problem, on the other hand, has an overly simplistic solution, but the reason why the key had to have a solid handle was quite clever and one feels it could've contributed to the book being more well known, especially among locked room fan boys like myself, if the trick had a bit more imagination and originality to it. All in all, a solid effort by a writer who was better known and praised for his critical work than his writing, but showed some true craftsmanship by springing a surprise or two on the reader with a relatively simple plot. And on a side note: after my enthusiastic start on this blog my output will probably trickle down a bit in the weeks to come, but please continue checking back here regularly for updates and I will try to vary the subjects of my posts in the near future (i.e. not just reviews). "Delay in vengeance gives a heavier blow"
Christianna Brand published her first detective novel, Death in High Heels (1941), in the early years of World War II, and was part of the last wave of puzzle orientated detective writers to emerge from the Golden Age. However, despite being a late arrival on the scene, in a world that was torn asunder by war and a waning interest from the publishers for the formal detective story, she quickly managed to claim her spot in the upper-echelons of her craft. She was absolutely brilliant when it came to clueing, comparable to John Dickson Carr at his most ingenious, and was arguably better than Agatha Christie with the closed-circle of suspects format, but what sets her stories apart from either of them is that Brand tends to make you care for her characters – most notably in London Particular (1952), in which all of the suspects are likeable people who care for one another. This makes her whodunits more than just a game of Clue between the author and a quick-witted reader, but also gives them a penchant for dark and bleak endings. Death of Jezebel (1948) is one of the more elusive titles in the genre, but one that's worth every effort and penny spend trying to obtain it – as it contains all of Brand's strong points and more! The first act of this tragedy opens with a prologue in which Johnny Wise, a nice and handsome young man, commits suicide after discovering that his girlfriend has been unfaithful to him. Years later the three main players, Johnny's unfaithful girlfriend, the man with whom she betrayed him and her rotten friend who egged them on, take part in a Exhibition pageant when they suddenly start receiving threatening letters – prophesizing their impending demise (I got a bit worried at this point, since the plot started to resemble one of those awful Hajime Kindaichi mysteries). With the stage set for murder the actors take their place and before the show comes to a close, Isabel Drew's lifeless body lays amidst a troupe of knights in armor on horseback – murdered in full view of a thousand eyewitnesses, but it seems impossible that anyone could've entered the sealed and watched tower or reach the top unseen to strangle her and throw the body over the balcony. Further complications arise for Cockrill and Charlesworth when, shortly thereafter, a second victim turns up with his head chopped off (Didn't I say this was a lot like Kindaichi?). Cockrill is a wonderful and a quite interesting detective, very self-deprecating who nonetheless craves to be recognized for his ability as a Great Detective – and I'm sure he made a believer out of Charlesworth when he pieced together the solution behind the impossible nature of Isabel Drew's death. The solution in question is quite simply brilliant, although there's nothing simple about the method the murderer employs here, and the devilish clever clues, such as shining armors, colored cloaks and coils of rope, shows her natural gift for clueing and misdirection – making this reader want to kick himself for missing, and disregarding, some of the things that he should've gotten right. And every bit as ingenious and amusing are the series of false solutions and confessions, both mostly done by the suspects themselves, preceding the final dénouement, which seems to be a recurring theme in Brand's work and the icing on the cake! Whether it's better or not than Green for Danger (1944), her other masterpiece, is debatable, but both are guaranteed permanent residence on my book shelves. Stumbling across, or hearing about, a new detective writer is one of the most fun, and frustrating, parts of reading and collecting mysteries. 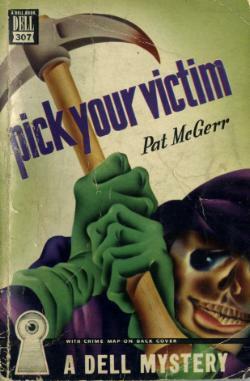 Just when you think you've got a pretty good grasp on the genre, you trip over an old paperback edition of Pick Your Victim by one Pat McGerr or some of your fellow detective enthusiasts suddenly start recommending an all-but-forgotten author whose work has faded into complete obscurity. 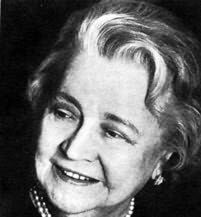 Jane Lewis Brandt, who published only four detective novels under the nom-de-plum of "Lange Lewis," is one of those authors who has had the misfortune of being obnubilated from popular view – and it's hard to judge from the book I just read, Meat for Murder (1942), if her descent into biblioblivion was justified or not as the book is very uneven in quality. It all begins very promising when Earl Falkoner, an eccentric vegetarian, health addict and successful designer of stage sets, employs three young writers at his home, The House on the Hill, to help him write a stage play. 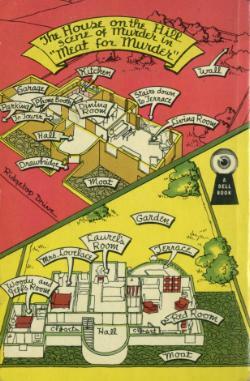 The house is actually a white stucco castle-like building right down to a moat, drawbridge, walled garden and a tower. It goes without saying that with such setting comes a cast of outré characters. Upon their arrival, the three writers, Laurel, Jeff and Woody, meet Falkoner's two bodyguards, one of them engaged in the act of chasing the cook, who's also a religious fanatic, with a carving knife. 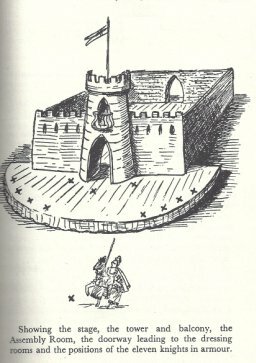 There are three very hungry dogs, one great Dane and two spotted coach dogs, roaming the grounds of the house, and the tower is inhabited by a very unusual houseguest: a small, French mathematician who seems to be at odds with his host. But they also meet a couple of people who live elsewhere, such as two of their disgruntled predecessors, who threaten their former employer with a lawsuit, and three women who buzz around in Falkoner's life – and who may, or may not, be in love with him. These opening chapters, introducing promising situations and sometimes slightly cracked characters, are the best part of the book and tends to give the reader the feeling that he's reading an unknown and recently unearthed Ellery Queen novel, but it quickly turns into an uninspired, run-of-the-mill detective story when someone starts liberally sowing arsenic about the place – nearly poisoning one of the women and killing Earl Falkoner and his three dogs. 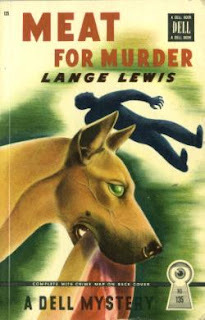 Lewis proposed a lot of potentially good ideas with an interesting set-up, but failed to deliver on pretty much all of them – including one that should've granted her immortality: introducing, what probably was, the first female homicide detectives, Brigit Estee, who assists Lieutenant Tuck in his investigations. There were, of course, an abundance of female amateur sleuths in the early 1940s and there were even a few female private eyes who ran their own agency, like Rex Stout's Dol Bonner and Torrey Chanslor's The Beagle Sisters, but not, as far as I am aware, one who was an official and equal member of a homicide squad. Unfortunately, she doesn't contribute anything of substance to the story and gushes how romantic detective work is and offers a few shaky theories. But maybe I am too harsh on Lewis. In spite of it's short comings and under whelming conclusion, it was still a fairly entertaining and fast read that went off with a promising start, but ran out of gas halfway through. Oh well, not every obscure and nearly forgotten title that I will tackle for this blog will turn out to be a masterpiece of plotting and misdirection. Pick Your Victim (1946): a detective story in reverse. Pat McGerr's Pick Your Victim is a comparatively little-known entry into the annals of crime fiction, but which is nevertheless held in high esteem among a small group of knowledgeable and well read Connoisseurs of Crime – praising the story for its unique take on the classic detective format, that's both original and successful. This unique approach to the formal detective story is basically telling it backwards: you start with the identity of the murderer and than work your way back to figure out whom the victim was. So you first meet the murderer, followed by searching for clues, and conclude with the corpse. The story opens with a group of Marines, stationed in the Aleutians, whom are threatened to succumb to boredom and the monotony of daily routine, when one of them discovers that his package from the home front is padded with a heaping bundle of torn newspaper scraps. Needless to the say the scraps of paper are eagerly devoured, however, among the bits and pieces on boxing bouts and advertisements for women's garments is an incomplete account of a murder committed at the Society to Uplift Domestic Service (SUDS for short) back in Washington. Paul Stetson strangled one of the SUDS officers to death at their office, but parts of the article, that would've informed them on the victim's identity, are missing. 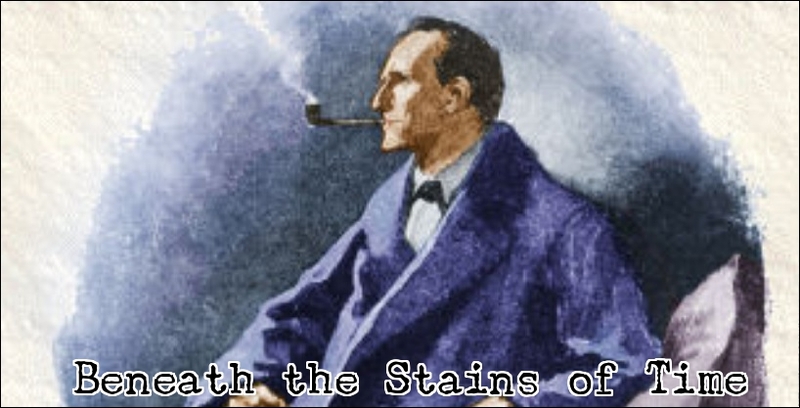 Well, this still being a detective story there's an incredible coincidence that one of them, Pete Robbins, just so happens to be an former employee of SUDS – and he can tell his comrades quite a lot about his time there. They set-up a pool and try to deduce the victim's identity based on the information provided by Robbins during an on-going flashback that covers several years and most of the book. A drawn-out flashback, detailing office gossip and troubles, perhaps sounds a bit dull, but it wasn't tedious for even a single sentence, and there's much more beneath the surface than mere work floor rivalries – like serious attempts at usurping the society's presidential seat and nearly driving someone to commit suicide. Not to mention several violent outbursts that almost resulted in a couple of early murders. I agree with the experts' opinion that the book truly offers a most singular problem, and not just for its original take on the detective story, but also for its fair play and brilliant simplicity – most brilliant ideas are brilliant because they're simple, and this is a textbook example of that. In short: a one-of-a-kind masterpiece!